The easy calm of a residential neighborhood – so hard to find in busy Paris – is one of the things that makes the Gare de Lyon/Bercy neighborhood so unequivocally charming. You’ll find yourself strolling along flower-laced lanes, through lively markets, above-ground gardens built on defunct railways, and large parks – all hot commodities in a tightly compacted and crowded city like Paris. The Gare de Lyon/Bercy neighborhood spans the 12th arrondissement and 5th arrondissement in the southeast corner of Paris. One of the city’s main train stations, the Gare de Lyon, sits at the northern end of the neighborhood on the right bank (rive droite), with the Bercy Village shopping area rounding out the southern tip. Just to the west are the impressive Jardins des Plantes gardens and the Paris Mosque. The Seine river cuts between the two arrondissements, running north to south. The Gare de Lyon offers access to Paris metro lines 1 and 14, plus the RER A and D suburban trains. To see Bercy Village, stop off at Bercy on line 6. For the Jardin des Plantes and the Paris Mosque, get off at Quai de la Rapée on line 5 and cross the Pont d’Austerlitz bridge, or stop at Jussieu on line 7. At the heart of this district lies the Gare de Lyon station, an ornate structure originally built for the World Exposition of 1900. Known for its elegant architecture and striking clock tower, the train station is one of the busiest in Europe. 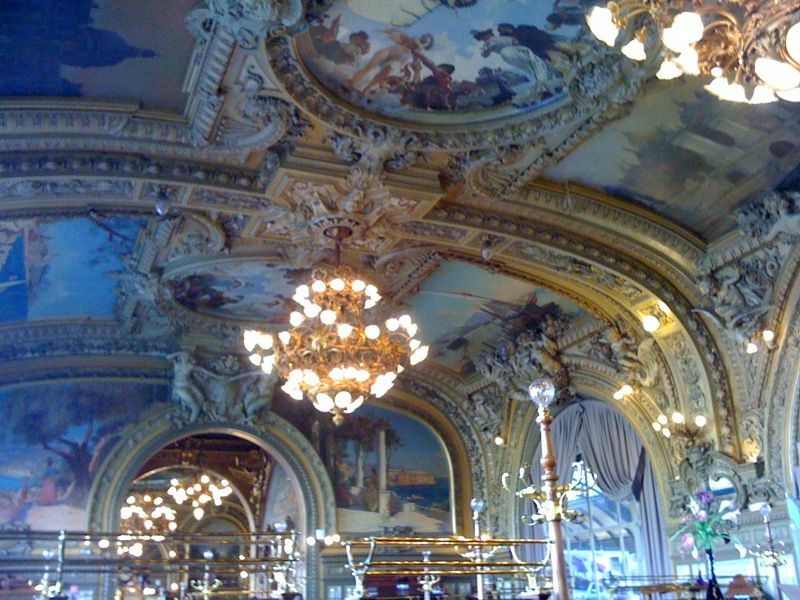 It is also home to Le Train Bleu restaurant, serving travelers since 1901. For over a century and up until 1960, the area now housing the Bercy Village was an immense market for wine vendors, including the white stone cellars of Cour St Emilion. If you’re arriving in Paris by train, chances are you’ll see the inside of the Gare de Lyon. The largesse of the station will leave you in awe and makes a great first impression of the city. Welcoming around 90,000,000 passengers per year, the station is constantly buzzing with intensity. Watch out for the errant pigeon and keep an eye on your belongings. This out-of-commission railway turned garden walk is nothing short of gorgeous. Blooming flowers, trees and plants accompany you on a one-kilometer stroll from Bastille to the Jardin de Reuilly. Colorful mosaics, curving archways and a nearly 110-foot minaret are among the highlights at one of France’s largest mosques. While the prayer spaces can only be accessed by practicing Muslims, the courtyard and halls can be visited through a guided tour or on your own for a small fee. This botanical wonderland comprises twelve distinctive and lovely gardens. You’ll get lost along the lanes, moving through the immaculate Japanese garden, botanical herbs or sky-high tropical trees. Definitely devote a few hours to the park and come on a sunny day to truly benefit. While you're there, make sure to check out the charmingly retro collections at the Museum of Natural History on the same grounds: the old-world paleontology gallery there is especially interesting, with dinosaur and woolly mammoth bones certain to intrigue visitors of all ages. This market is one of the true gems of the neighborhood and an old favorite for locals. Head inside for the winding halls of charcuterie, cheese and fish vendors, or outside in the sun where the fruit and vegetable stands set up shop. It's perhaps the most well reputed of Paris' outdoor temporary food markets. Come early to beat the crowds or wait it out until the bitter end, where vendors practically give away produce for free. You need not be a wine snob to visit this ultra-trendy hole-in-the-wall wine bar, but you shouldn’t be afraid of enclosed spaces. If you actually manage to win a spot at the packed bar or one of the indoor tables, consider yourself lucky. Most likely though, you’ll be setting your glass on one of the outdoor wine barrels, windowsills or even nearby dumpsters. While this may sound unappealing, Le Baron Rouge makes all of the above seem disgustingly hip. Choose from their enormous selection of reasonably priced wines, coupled with a cheese or charcuterie plate. Sundays offer fresh oysters. Note that this is one of the bars listed in our feature on the best wine bars in Paris! Sink into one of the comfortable armchairs while servers bring you mint tea, couscous, tajines and nut-and-honey pastries on large copper trays. Music from the Orient accompanies your meal to truly take you away from Paris for a few blissful moments. You’ll think you’ve landed in an American suburb after arriving at this modern outdoor shopping mall. One long sidewalk of shops, plus an 18-screen movie theater, make up this chic yet laid-back shopping hub. A great place to look for clothes and home wares on Saturdays, or enjoy a meal on one of the many restaurant terraces on Sundays. A cinema lover’s dream, this museum and cultural center is wholly devoted to the glories of celluloid. Rotating exhibitions capture an artist or time period within cinema, while old and new films are shown throughout the day. Auditoriums play host to conferences and special events throughout the year, as well as a library devoted to all things cinema. This dance club on a boat docked on the Seine is the place to be on a weekend night. Take a nap in the afternoon to keep your stamina for the all-night dance party, with great views of the city from the water.